5 Easy No-Bake Halloween Treats | Must Try Halloween Party Food Ideas! 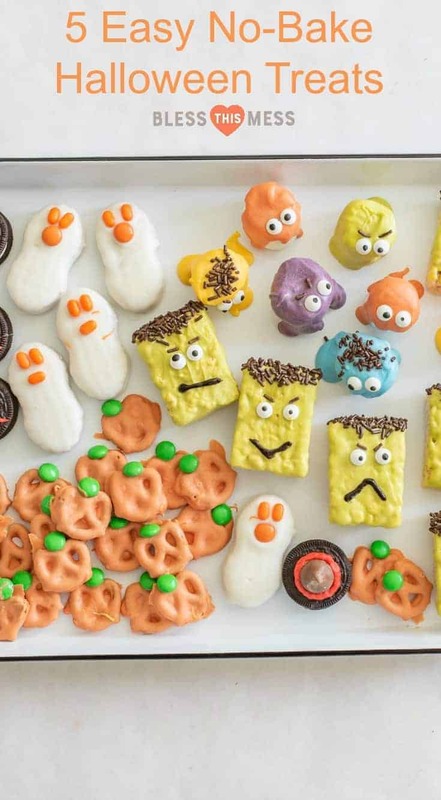 5 fast, kid-friendly, no-bake Halloween treats that are so easy to make, your kids could do it on their own. Who else loves all things October?! Bring on the pumpkins, parties, homemade donuts, and all things fall! 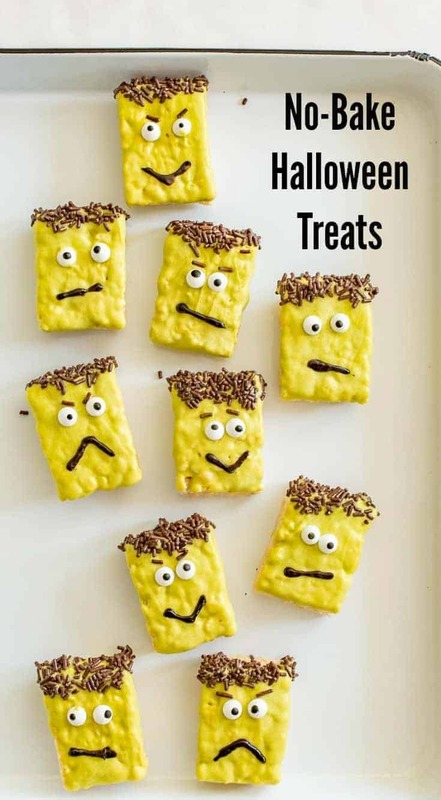 These super easy no-bake Halloween treats are my little gift to you to start your month off right. These are so easy, super cute, and perfect to take to a party or to plan for your kids to make after school. I love little treats like these because they feel like they are almost an edible craft project. Fun to make and fun to eat! My no-bake Halloween treats feature store-bought items so that you really don’t have any prep to do ahead of time. 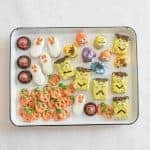 You probably don’t need a lot of instructions to make these, but I’ve gone ahead and written it all out for you including tips and tricks on where to find everything you’ll need to make your Halloween treat-making party a success. This post is part of a little Halloween event my friend Tara from Tara Teaspoon and I are hosting! We’ve dedicated a few days in a row to sharing our favorite Halloween recipes! 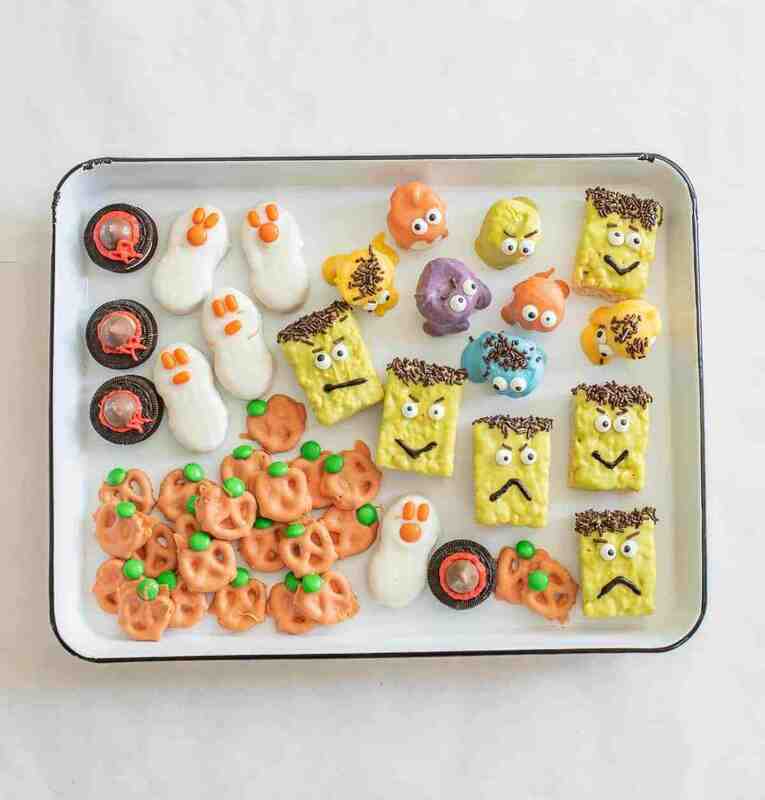 Today Tara is sharing the cutest Halloween Pumpkin Marshmallows on Cupcakes . Seriously how cute are those? I LOVE how festive these are and can’t wait to make them with my kids. Check them out! Our little store only had a few colors of candy melts. I discovered that you can mix them like you would mix paint! I melted 2 parts yellow to 1 part blue to make green and did 2 parts yellow and 1 part red to make orange. Worked great! Adding food coloring to the white Almond Bark did NOT work, though. The melted candy seized up when I added it and I ruined the whole batch. You can find candy eyes in your local store near the sprinkles or with the candy melts. You can even order them on Amazon because the internet is amazing. It’s pretty easy to make all of these at once. Just melt a bunch of candy melts and get to work. 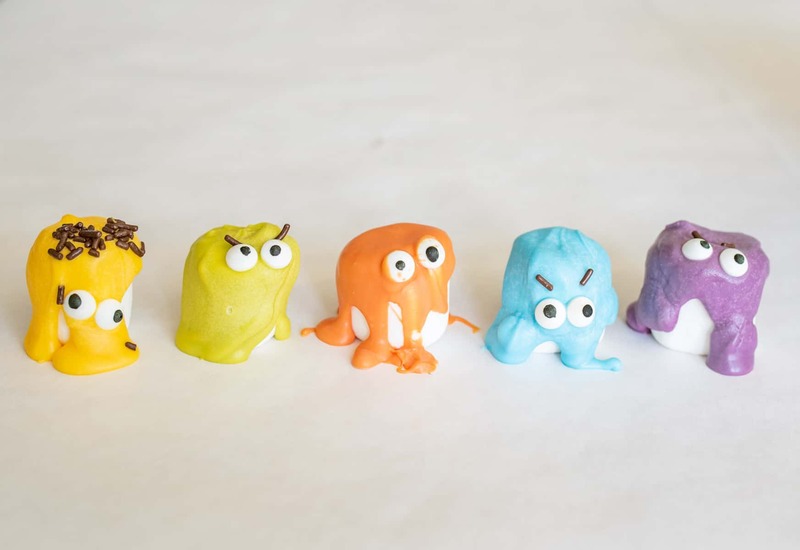 Then use up any leftover colors to make the marshmallow monsters. The variety is a fun to have. The hardest part of making these treats is letting the candy melts cool and clean up. I’m telling you, easiest fun project ever! 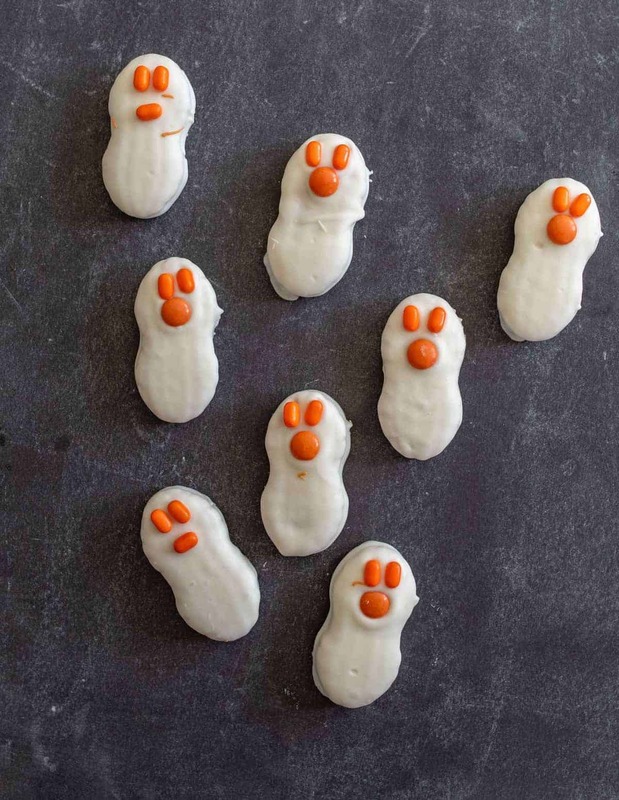 We LOVE to “Boo!” our neighbors (door bell ditch a treat). Here’s a Free Halloween Boo Poem Printable so that you can do it too! 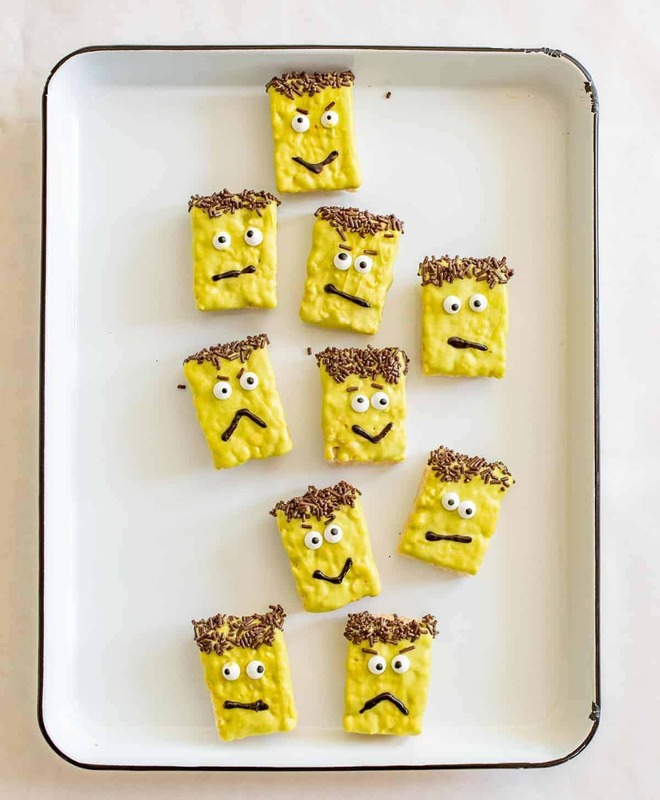 5 fast, kid-friendly, no-bake Halloween treats that are so easy to make your kids could do it on their own. Melt 1-2 cups orange candy melts according to package directions. Dip pretzels into melted candy melts and use a fork to fish them out again. Tap the fork on the edge of the bowl to remove extra candy. Place covered pretzel on a piece of wax paper. 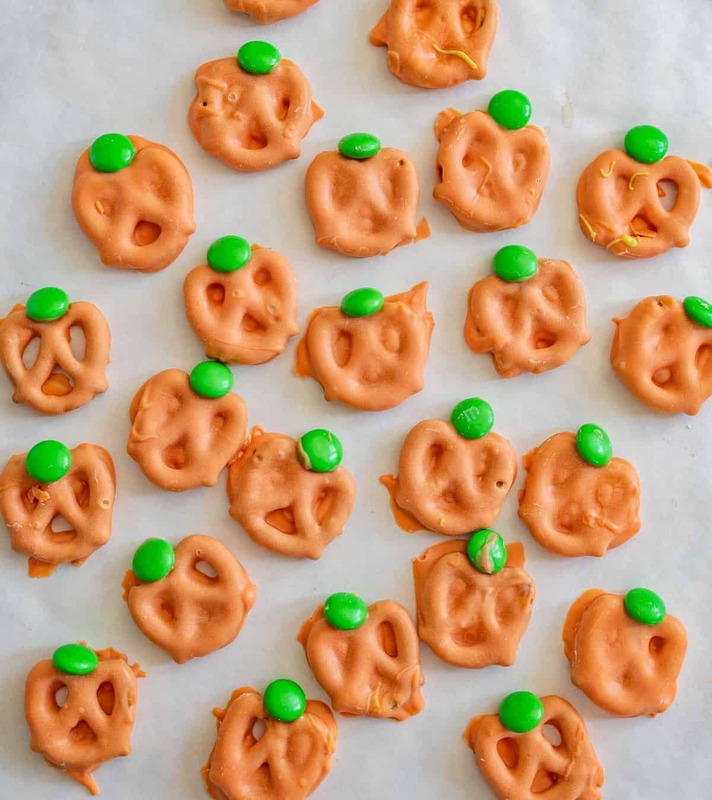 Place a green M&M candy at the top of the pretzel while the candy melt is still melty – it should look like a pumpkin stem. Let the candy harden before removing your pumpkin pretzel from the wax paper. Place a small amount of red icing in the center of the Oreo cookie. 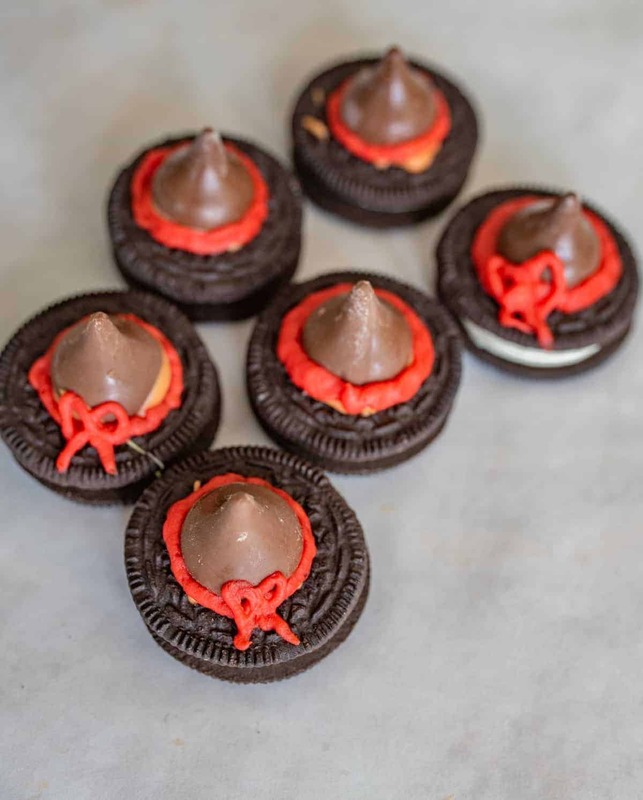 Press an unwrapped Hershey Kiss to the cookie where you put the icing. Let the icing squish out from under the kiss a bit so that you can see it. You can add additional icing around the Kiss to look like a bow if you like. Melt the Almond Bark white melting candy coating according to package directions. Dip the Nutter Butter cookies into melted Almond Bark and use a fork to fish them out again. Tap the fork on the edge of the bowl to remove extra candy coating. Place covered cookie on a piece of wax paper. Place orange M&M candies at the top of the cookie to look like eyes and a mouth while the candy melt is still melty. You can use other colors of M&M’s as well and even orange Tic-Tacs. Let the candy harden before removing your cookie from the wax paper. Pour chocolate sprinkles into a small bowl. Unwrap a Rice Krispies Treat and dip the front into the green candy melts, no need to dip the whole thing. Press the top into the bowl of sprinkles so that the sprinkles stick to the wet candy melts to make Frankie’s hair. Set the Rice Krispies Treat on a piece of wax paper. Add two candy eyes while the candy melts are still soft. Once the candy melts have set, use black piping gel to make a mouth. Melt any color of candy melts you want according to package directions (different colors in different bowls). Stand marshmallows up on a piece of wax paper. Use a spoon to spoon the melted candy over the marshmallows so that the candy drips off the top of the mallow. Repeat with remaining mallows and candy melts. Before the candy melts harden, add candy eyes to your monsters and chocolate sprinkles as hair or eyebrows. Let the candy melts harden before removing from the wax paper. Our little store only had a few colors of candy melts. I discovered that you can mix them like you would paint! I melted 2 parts yellow to 1 part blue to make green and did 2 parts yellow and 1 part red to make orange. Worked great! Adding food coloring to the white Almond Bark did NOT work though. The melted candy seized up when I added it, and I ruined the whole batch. You can find candy eyes with the sprinkles or with the candy melts. You can even order them on Amazon because the internet is amazing. Seriously, how fun are these? I can’t wait for you to make them at home and enjoy them as much as we did. Happy Halloween baking from our kitchen to yours!